The most careful assessment to date of one of the most successful spy rings ever. 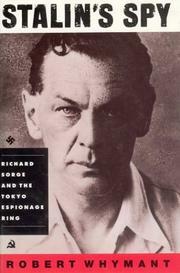 The career of Richard Sorge, the son of a German father and a Russian mother, was filled with paradox. He fought bravely in the German army during the First World War and was wounded three times. He became a committed communist after the war, but his wounds served to inoculate him from the suspicions of the German officers among whom he worked as a journalist in Tokyo from 1933 to 1941. His Soviet spy ring, using both Japanese and Germans, was often better informed than the German Embassy, which leaned heavily on his expertise, the ambassador even allowing him to use the embassy code books. He warned the Soviet Union of the impending German attack, almost to the day, only to have his warning regarded by Stalin as a provocation. He was almost ludicrously indiscreet in his conversation, was frequently drunk, and even seduced the ambassador’s wife, but the sheer recklessness of his conduct served somehow to insulate him from suspicion. And when he was finally caught, the Soviets allowed their most successful spy to be hanged rather than save someone who knew the full extent of Stalin’s blunder. This account, by the Tokyo correspondent of the Times of London, is the first to use both the Russian Defense Ministry and KGB files, German diplomatic archives, and Japanese and German memoirs and official records, even including the account of his career written by Sorge in prison. Whymant believes that Sorge’s information made it safe for the Soviets to transfer their troops from the Japanese to the German front, and hence stem the tide at last. Hence the final paradox that, by helping to stop Hitler, his greatest service may have been to the West. A judicious and often gripping account of a spy who, in his own words, penetrated the hard shell of Japanese society, and found that it was soft inside.